The rapid expansion of palm oil plantation has provoked reactions from environmental and agrarian movements, domestically and trans-nationally. 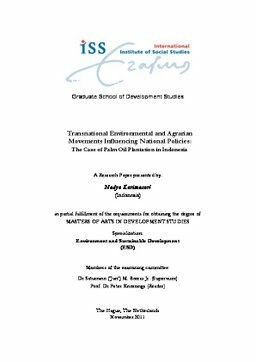 This research attempts to compare four different Transnational Environmental and Agrarian Movements (TEAMs) in the case of palm oil activism in Indonesia. TEAMs are heterogeneous, ranging from the spectrum of environmental justice movements, peasants movements, radical environmentalists, and a Non- Government Organization applying the market-based approach. They have a different approach to perceive the problem, which resulted in different demands and action. Hence, they invoke different kind of change in the policy formulation related to the transformation of palm oil plantation. Relevance to Development Studies Environmental pressure is getting more influential in the decision making process of development practice. But, little has been known about the type of influence the “environment” can bring to national government, because environment cannot speak for itself. The concern of environment is being understood, mediated and communicated by environmental movement. With this regard, what kind of process is going on internally in the TEAMs, and how exactly does different approach of environmental problem translated differently in shaping the kind of development practice to be pursued, is still understudied. This study will try to discuss how different approach to see the environmental problem would colour the national regulation about how development practice could be improved or changed in terms of reducing environmental harm. Thesis Advisor Borras Jr., Saturnino M.